NEWPORT, R.I. (October 7, 2017) - After eight races, eight varied race winners and a wide range of racing conditions, Drew Friedes' PACIFIC YANKEE with tactician Morgan Reeser and crew member Charlie Smythe have captured their very first major international title in the Melges 20 Class, that of World Champions. It's a title and trophy that is anything but easy to come by, and Freides' long racing campaign which includes a runner-up finish at Worlds in 2016 with the same crew, has served him well and delivered exactly what he was after - the top trophy in the most rewarding Class of boat in the World. With this win, he also strengthens his placement on the World League Circuit and remains atop the North American Division standings. "When I got the boat three years ago, Charlie Smythe came with it. I've only left the dock without him once,' said Freides. "We worked really hard. We've been to every event. We're fortunate that the chips went our way this week. Things fell into place for us this year. 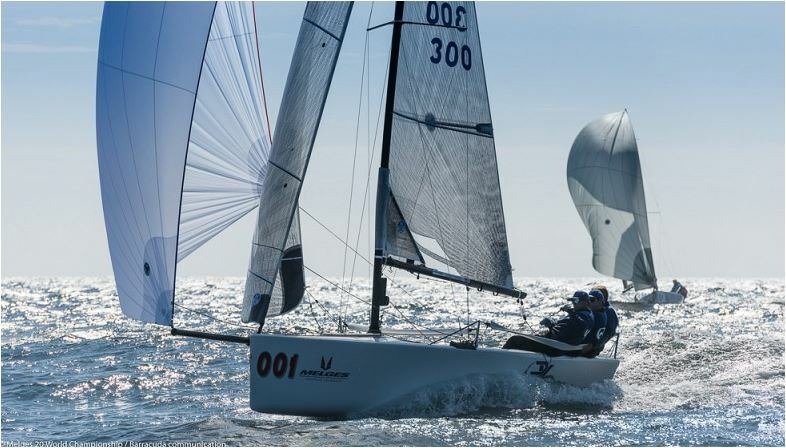 The Melges 20 fleet is second to none. And that's what drives all of us to race the Melges 20. Not only are the boats exhilarating but the people are amazing. Everyone's fun to be around and the talent is incredible." Freides continued: "I bought this boat three years ago because my mom was dying of cancer. She made me get a Melges 20 before she passed away because she knew how much it meant to me. This win's for her. We did it." Vladimir Prosikhin's NIKA claims second place on a brand new boat in Newport, and with such a great result it enhances his position on the International World League stage as well. Rounding out the World Championship podium is John Kilroy Jr.'s SAMBA PA TI in third. Former Melges 20 Gold Cupper Alessandro Rombelli's STIG, and Jim Wilson's OLEANDER complete to the top five respectively. Much like yesterday, today's one and only race got underway after a lengthy postponement, featuring light and shifty conditions. Freides won the event with a race to spare, leaving the rest of the top contenders to duke it out for podium positions. The conditions were kinder to some rather than others with Russia's Yuri Morozov on RUSSOTRANS taking the win, chased by Dario Levi's FREMITO D'ARJA finishing up in second, and Prosikhin grabbing a nice third. Congratulations to Canada's Justin Quigg and CHARACTER 2.0 teammates Julian Plante and Nick Cleary as they are 2017 Melges 20 Corinthian World Champions! Practically from start to finish, Quigg commanded the Worlds all-amatuer division for a huge win. Brazil's Cesar Gomes Neto at the helm of PORTOBELLO came second followed by Johannes Lind-Widestram's INTERMEZZO finishing third.